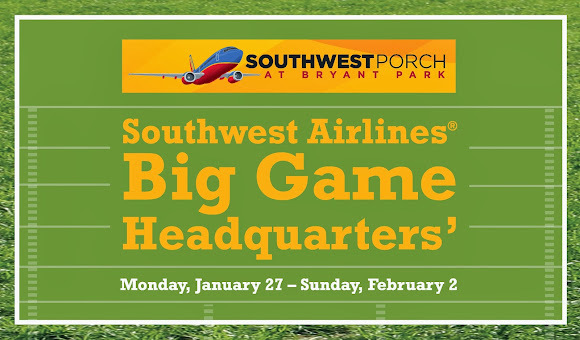 After you get in the zone with Big Game activities on Broadway, head over to the Southwest Porch at Bryant Park – your ultimate Southwest Airlines® Big Game Headquarters' amidst the football frenzy. Warm yourself by the fire, enter to win airline tickets, put your feet up, and sip a tall one as you enjoy the best week of football all year long. We guarantee you’ll be as comfortable as if you were at home in the recliner. Play an epic game of Flick Football, warm up with our toasty heat lamps, and try Game Day Eats from 'wichcraft like burgers, beer, hot apple cider, brats, chili and guac. 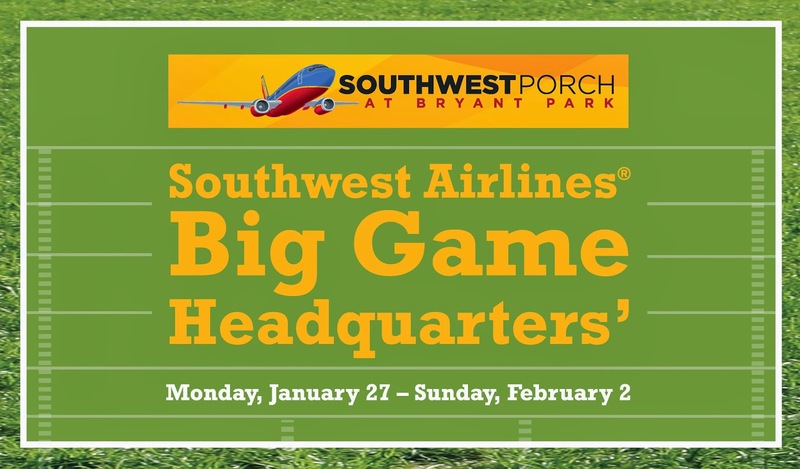 And be sure to Put Your Game Face On and join us at the Porch for a screening of the Big Game on Sunday! Show us your best Game Face at the Porch, and you'll be entered to win a pair of roundtrip tickets! Share your photo on Instagram and tag it with @SouthwestAir and #PorchNYC. All entries between Monday, January 27 and Sunday, February 2 at 11:59pm EST will be eligible to win. We'll select a winner on Monday, February 3 based on judging criteria. John Stephenson, the President and CEO of Atlanta Hall Management and College Football Hall of Fame, will provide an inside look at Atlantas' new College Football Hall of Fame opening on August 25, 2014. Come learn how the history, traditions and those who have defined College Football will come to life in a new state-of-the-art facility through an interactive experience. As all of you football fans visit the park and the Southwest Porch, please remember that some north-south routes will be closed the week of December 27, and we appreciate your patience and flexibility as you navigate your way around these fun, open-to-the-public events in the park. Keep an eye out for directional signage for park visitors to help you navigate throughout the park! Click through for complete rules. a. Southwest Airlines “Put Your Game Face On” (“Contest”) will begin on or around 10 a.m. PT on Monday, January 27, 2014 and will end on or around 11:59 p.m. PT on Sunday, February 2nd, (“Contest Period”). During the Contest Period potential entrants will have to follow Southwest Airlines on Instagram® via the handle @SouthwestAir, Facebook via Southwest Airlines page, and/or Twitter via the handle @SouthwestAir to receive the notice of the contest and be directed to the official rules on the Nuts About Southwest blog. Official rules can also be found at blog.bryantpark.org. Submit an Instagram photo during the Contest Period with a photo showing us your “game face” and include the Southwest Porch at Bryant Park. Participants may incorporate a FUN caption telling us about your Big Game experience; incorporate the Southwest Airlines brand via the Southwest Airlines Instagram handle @SouthwestAir using the hashtag “#PorchNYC.” Entrants may also share all “Game Face” Instagram photos on Twitter® and Facebook®, but will not be judged from those channels. All entries submitted will not be acknowledged or returned. By entering, Entrant grants all Sponsors an irrevocable, perpetual, royalty-free, freely transferable license to use the photo for all purposes, in any and all media, whether now known or hereafter devised. Photos must not be copied. Entries may not violate any third party rights nor use any third-party intellectual property such as logos or background signs. Entrants acknowledge and agree that their entry does not violate any rights of privacy or publicity and that they have the written permission of those appearing in their photo to submit their image. Entries must not disparage; contain material that is inappropriate, indecent, or vulgar; or promote bigotry, racism, hatred or discrimination based on race, gender, religion, or sexual orientation. Use of any device to automate entry is prohibited. Proof of submission of an entry shall not be deemed proof of receipt by Southwest. Southwest Airlines’ computer is the official time keeping device for the contest. Southwest is not responsible for entries not received due to difficulty accessing the internet, service outage or delays, computer difficulties or other technological glitches. By entering this Contest, you agree to abide by these Official Rules and acknowledge that this Contest is in no way sponsored, endorsed, or administered by or associated with Instagram, Twitter or Facebook. c. One entry per person is permitted per day. Any person found using multiple Instagram, Facebook, and/or Twitter accounts to enter will be found to be ineligible. Multiple entrants are not permitted to share the same Instagram account. a. The contest is open to all legal residents of the 48 contiguous United States and the District of Columbia who are 18 years of age or older and the age of majority in their place of residence and have a valid e-mail address and an Instagram account as of January 27, 2014. Void in Puerto Rico and where prohibited or restricted by law. The contest is offered only in the United States. Employees of Southwest Airlines, AirTran Airways, and the members of their immediate families (spouse and parents, children and siblings and their spouses) and individuals living in the same households of such employees are ineligible to enter or win. The contest is subject to all applicable federal, state, and local laws and regulations. b. Only one winner per household is permitted in any Contest administered by Southwest Airlines. c. Entrants are required to provide truthful information and Southwest will reject and delete any entry that it discovers to be false or fraudulent. Southwest Airlines will disqualify any entry from individuals who do not meet the eligibility requirements, and Southwest Airlines will also delete any entry received from persons under the age of 13 in compliance with the Children’s Online Privacy Protection Act. a. Grand Prize: One (1) winner will be awarded two (2) Southwest Airlines roundtrip tickets from the closest major airport to winner’s residence served by Southwest Airlines. Southwest Airlines tickets are subject to Southwest Airlines terms and conditions; certain restrictions may apply. No blackout dates. Tickets valid on Southwest-operated, published, scheduled service only. Tickets are not valid on code-share or AirTran operated service or any international service. Airline tickets awarded will expire one year from date of issue. Expiration dates will not be extended, and tickets will not be refundable or redeemable for cash or credit at any time, nor will tickets be replaced if lost or stolen. Tickets may not be sold to a third party. If the winner does not live in a city served by Southwest Airlines, he/she is responsible for transportation to the nearest airport served by Southwest Airlines. Prizes must be accepted as awarded. No prize substitutions, cash equivalent, or transfer of prizes permitted except at the sole discretion of the Sponsor. Prize subject to availability and the Sponsors reserves the right, at its sole discretion, to award a prize of greater or equal value if the advertised prize is unavailable. Taxes, if applicable, are solely the responsibility of the winner. b. In the event that a prize is mailed to the winner, it will be with the prior written consent of the winner and therefore, winner assumes the risk of its loss. Sponsors are not responsible for the safe arrival of a prize. Decisions of judges with respect to the Contest are final. This is a contest of skill. Your chances of winning depend on how well your entry reflects the judging criteria, as compared to the other entries in the contest. Southwest Appeal: 35% photo should reflect fun Culture and Fun-LUVing Attitude. Rules: 20% Read and complied with the official rules. a. The top “Put Your Game Face On” submission will be selected by a panel of judges from the Corporate Communications and Marketing departments at Southwest Airlines and Bryant Park Corporation on or about February 3, 2014. You need not be present to win. b. Potential winner notification will be made on Tuesday, February 3, 2014 by Sponsors via Instagram. Potential winner will be asked to contact Southwest with a given e-mail address provided via comment on the entrant’s Instagram entry. Once a potential winner and Southwest make e-mail contact, Southwest will provide a photo for the potential winner to upload to the Instagram account the user uploaded the photo with in order to validate their account. Once the validation occurs, potential winner must execute and return any required affidavit of eligibility and/or liability/publicity release in which they agree to hold Sponsor, Instagram, Twitter, Facebook, and each of their parent, subsidiary and affiliated corporations, and their officers, shareholders, directors, employees, agents and representatives harmless against any and all claims or liability, damages, or causes of action (however named or described, arising directly or indirectly out of (i) entrant’s participation in the contest, and (ii) the receipt, use, or misuse of the prize awarded herein. The affidavit of eligibility and/or liability/publicity release must be returned within three (3) business days after prize notification or prize will be forfeited and awarded to an alternate winner. If the prize notification is returned undeliverable, if the potential winner is unable to validate their account, or if the potential winner is ineligible, the Grand Prize will be awarded to an alternate winner as determined by the judges. b. By participating in the contest, the winner agrees to have their name, voice, or likeness used in any advertising or broadcasting material relating to this contest, as well as posting the winner’s name and hometown on the winner’s list, without additional financial or other compensation unless prohibited by law, and, where legal, to sign a publicity release confirming such consent prior to acceptance of the prize. d. Southwest Airlines in their sole discretion, reserve the right to disqualify any person tampering with the entry process, the operation of Southwest Airlines website, or otherwise in violation of the rules. They further reserve the right to cancel, terminate or modify the Contest if it is not capable of completion as planned, including infection by computer virus, bugs, tampering, unauthorized intervention or technical failures of any sort. e. Sponsors reserve the right to make changes in the rules of the Contest, including the substitution of a prize of greater or equivalent value, which will become effective upon announcement. f. Failure to comply with the Contest rules may result in a contestant’s disqualification solely at the discretion of the Sponsor. g. The Sponsors are not responsible for typographical or other errors in the printing, the offering or the administration of the Contest, or in the announcement of a prize. h. Copies of the written Contest rules and a winner’s list (when complete) are available during regular business hours at Southwest Airlines, Marketing Customer Engagement, P.O. Box 36611, Dallas, TX 75235-1611. For a winner’s list, send a self-addressed return envelope, after February 2, 2014. All requests must be received by March 1, 2014.